How wearable's will impact health industry? Technological developments are changing the way we lead our lives. In the past we could have never thought about wearing a health on band our wrist and moving around. But, now wearable health technology is touching new levels of high. Innovative wearable technology is evolving at a rapid pace. Modern devices have been designed to precisely monitor your health as well as fitness activities. Wearable health technology is making an active foray into the mainstream and the sky’s the limit in the coming future. The functionality of wearable healthcare devices cannot be undermined. Health is prime area of concern these days. You cannot stay untouched with health concerns if you turn a blind eye towards them. Therefore, it is prudent to be pro-active in your approach towards health so that healthy lifestyles changes can be made before any serious ailment captures you. The market is swarming with innovative devices such as Hi-tech wristbands, watches, glasses other devices that can monitor your personal health data without any much effort or problem. You can now easily keep track of your vital statistics including your heart rate, number of steps which you have taken in a day, your quality of sleep, pulse and much more. On the basis of the statistic gathered you can refine your diet as well as exercise. This will improve your health as well as fitness levels. It is believed that in times to come there will be more than fifty million wearable gadgets available in the market which you can buy. Wearable health technology is all set to become the biggest trend globally. You can actually expect wearable gadgets to rapidly infiltrate into each and every facet of your life. Tech savvy people around the world are getting extremely enthusiastic about the ability of wearable s to assist them in leading a more active, vigorous and healthy lives. Wearable are at the forefront in the endeavour to lead a well regulated as well as fit life. The devices are ubiquitous and it is very common to compare daily step counts with your friends. Isn’t this quite motivating? When your motivation levels are high you will not falter in your fitness regime. Wearable’s are now being considered as valuable tools in numerous diagnostics processes as well as in treatments .Based on wide-ranging research and extensive interviews with experts it is seen that people are opting for healthcare wearable’s which are not merely considered as another extension of social media but effective tools in handling health issues Wearbles are without any second thoughts much more than effective than your regular smart phones as they offer a regular interface between the computer and user. They are never away from the user and because of this their impact on the user is quite high. They enable intelligence, ubiquitous computing and accurate biometric data tracking. 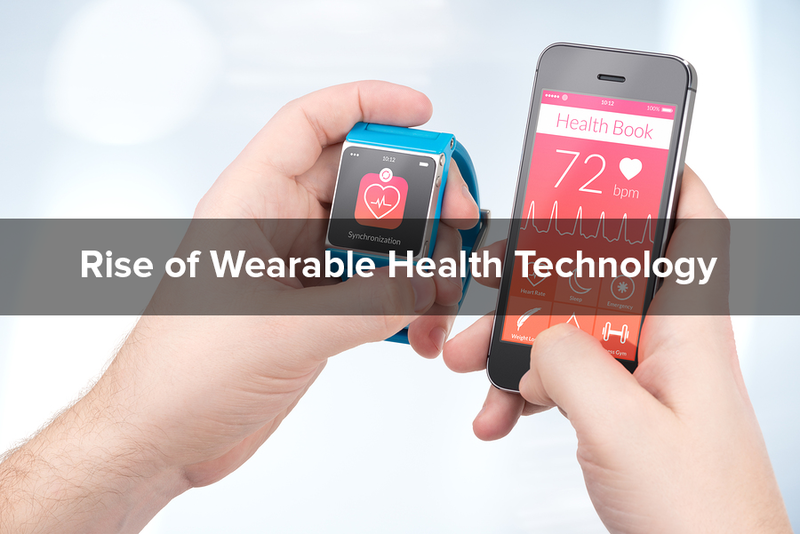 Wearable health technology will definitely enrich healthcare significantly . The Internet of things have favourable effects on the everyday lives of the people, with a growing dependency on wearable’s which help in scrutinising our daily activities. On using these intelligent devices your life will be so much easy and comfortable. This is an arena where you see vivid and practical mobile applications of IoT. In addition to providing the users with real-time data about their health, wearable technologies are forming an integral part of the “Internet of things,” the logical progress of the cloud and big data. The main idea behind is to enable the sensor-equipped “things” to correspond with one another in a noteworthy manner. The devices and sensors produced for this new Internet of things provides exceptional ease both for you and your doctor since the whole systems is focussed on you. Lead a healthy and comfortable life with the help of wearable technology. By Mentioning the word “wearable,” almost everyone will think that you are only talking about google glasses or wrist wear, but this concept is about to change drastically in future. With new kinds of wearable devices based on health technologies you can now understand your body and health more easily and clearly. Modern Healthcare wearable’s now are being used by health conscious people collecting fitness data to healthcare providers and insurers to improve health outcomes. For example one patient with Parkinson’s, disease describes how he is now using a reliable wearable device in order to track the severity of his tremors. He has created a digital diary which shows clearly how tremors respond to even small changes in diet, or sleep patterns or medication timing. The dynamics of Wearable health technologies has the potential to change the future of health care drastically. Latest devices are being used extensively by the tech-savvy generation for monitoring basic health and fitness health. Today most of the wearable’s which are available in the market are equipped with accelerators, GPS tracking and heart rate monitors. Even people with long term and critical health issues are benefiting from them. They have indeed become gateways for chronic patients who can now exchange clinical data with healthcare providers. The technology holds great potential for transforming consumer health as well as the healthcare system on the whole. It provides complete integration between the technological device and doctors’ offices. Thus it has an assertive impact on doctors’ ability to treat the patients. In Michigan, the latest gadget my Health Button is redefining the manner the people are handling their medical problems. The effect wearable’s are having on accountability to an individual’s own health is admirable .wearable’s present an incredible opportunity for doctors to examine patient data, especially in the pursuit of chronic disease management. JINS, which is renowned a Japanese eye-wear brand, has recently introduced the a regular fashionable pair of eyeglasses which have several sensors to monitor your level of fatigue, besides your burned calories, steps taken etc. Wearable health devices market in India is growing significantly and it is expected to touch one million units in the near future. This number is whooping and you cannot even imagine the impact it will have on your life. There is a dramatic rise in volume of sales of wearable devices. As wearable technology becomes main stream, it is expected the prices will decline in coming times because of increasingly competitive environment. The wearable market has grown tremendously because of fast advancements in technology, fast production of personal devices, and the ever increasing desire of people who aspire to watch and track their health and wellness efforts.